After more than four years of dealing with DC government agencies and fundraising, construction fencing arrived today at the library park at 3rd and I streets, which marks the start of phase one of construction of the SW Playground Project (SWPP). The contractors have begun pruning and removing dead or dying trees in the park. Phase one is expected to take eight weeks to complete and includes the following: pruning and removal of trees; grading of the site; installation of retaining walls along the center berm area; fencing along I Street and portions of 3rd Street and Wesley Place; playground equipment with a nature theme and soft surfacing in the center berm area; and utilities work. The budget for phase one is $450,000 and came from a combination of city funding and SWPP's fundraising efforts. A second phase will cost $270,000 and is still unfunded. The second phase will include storm water retention; more retaining walls; and repaving and scoring of the sidewalks. Two other playgrounds in the neighborhood are supposed to be upgraded later this year as a part of the Play DC Playground Improvement Initiative, including ones at King-Greenleaf Recreation Center and Randall Community Center. 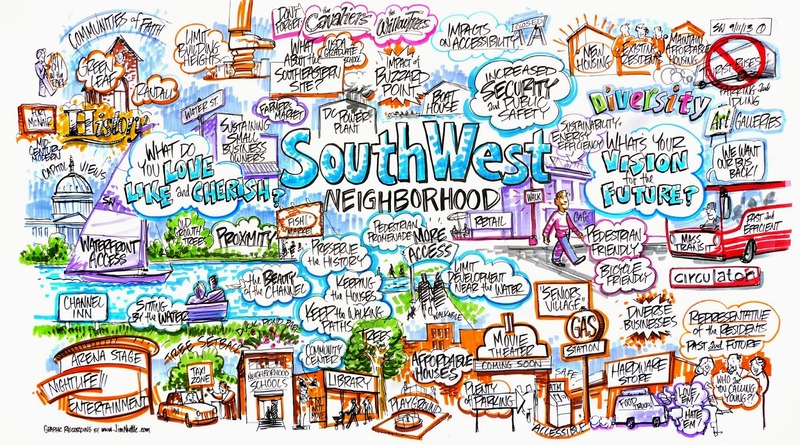 The SWPP is a project of the Near SE/SW Community Benefits Coordinating Council (CBCC). The Historic Preservation Review Board (HPRB) will evaluate plans for a new, private Museum of the Bible planned in the former Washington Design Center building at 4th and D streets on July 10. The museum is applying for historic designation for the building, hence the involvement of HPRB. According to the landmark application, 300 D Street is an eight-story building that was originally built in 1923 in the Neo-Classical Revival style (an addition to the east was built in 1983 when it became the Washington Design Center) for the Terminal Refrigerating & Warehousing Company for use as housing cold and dry storage warehouses, an ice manufacturing plant, and the company’s offices. Trains used to enter the building on the 4th Street side on a spur line to deliver goods and loading docks were located on the D Street and Virginia Avenue sides. An interesting note about the shape of the original building – a notch was created on the southeast corner along Virginia Avenue because row houses were there when it was originally built. 300 D Street is the only large, Neo-Classical-style warehouse still standing in the District. View from corner of 4th and D streets. 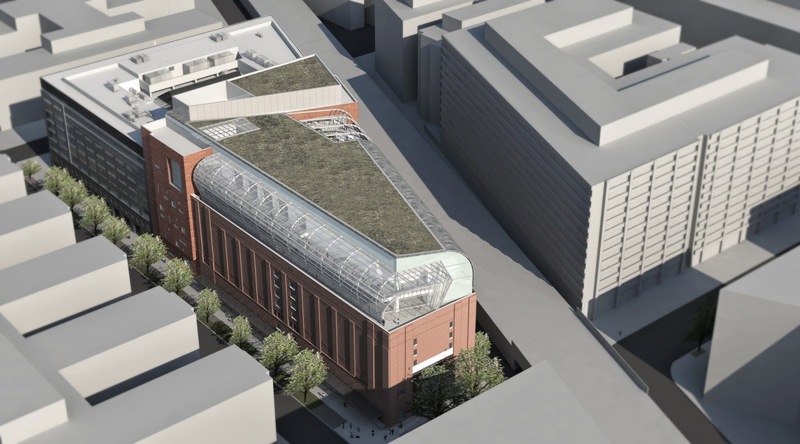 SmithGroupJJR has designed the museum to restore some elements of the building that were lost when it was converted to the Washington Design Center and create a new addition to replace the 1983 version, as well as build a large glass atrium above the existing building with a green roof. The museum will be approximately 400,000 square feet, about 30,000 SF larger than the existing building and addition. 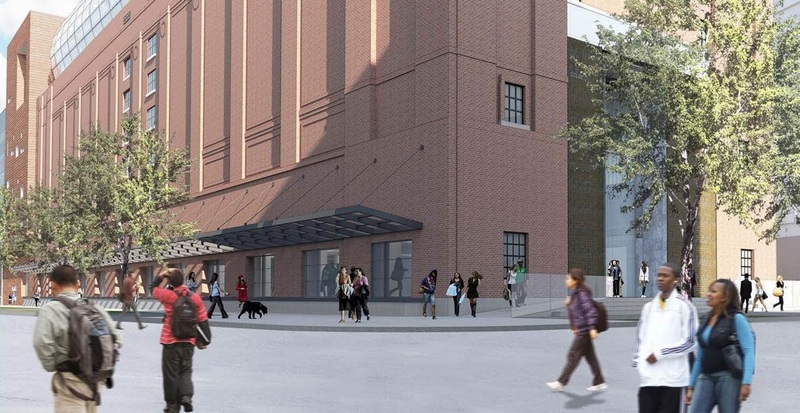 The main entrance will be located on 4th Street where the train used to enter the building and the loading dock bays that were on D Street will be retrofitted with windows and an open framed canopy above. The new addition will be made of oversized handmade bricks and have been designed to look like stacked bibles. On the first floor of the museum, there will be a lobby, museum shop, orientation desk, media wall, and security station. A grand staircase in the new addition will lead to the other floors. Above the first floor is a mezzanine level that will have a coffee shop and multipurpose room. The second through fourth floors will contain permanent exhibit space, while the fifth floor will contain an affiliated museum and performance hall. The sixth floor will have conference space, restaurant, lounge, and biblical garden. Special exhibits and museum support will be in the first basement level and space will be carved out in a second basement level for storage and staff support. 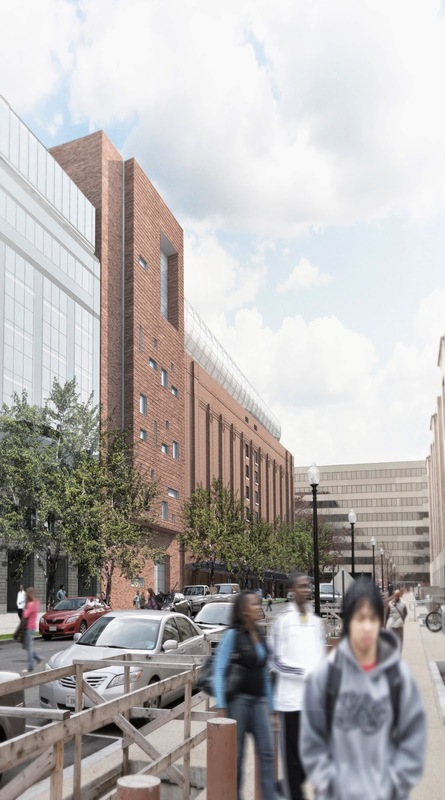 The adjacent office building will also receive a one-story addition for an institute with a conference hall, offices, library, education center, and housing units for visiting scholars. Planned addition on office building at 3rd and D streets. If approved, the museum is looking to open in 2017. UrbanTurf has gotten their hands on some renderings from Capital Pixel of the Wharf Club amenity space in Parcel 2 of The Wharf. The expansive space above the Wharf Center concert hall with views of the Washington Channel will have amenities for the rental apartment residents including a pool and deck with cabanas, fitness center, sand volleyball court, dog run, and lounge. This is the same parcel where a significant amount of the apartments will be “micro-units” with studios ranging from 300 to 400 square feet, so it appears that the large amenity space is making up for the smaller unit sizes. Washington Project for the Arts, a non-profit organization whose mission is to support artists at all stages of their careers and promotes contemporary art by presenting exhibitions, issues, and ideas that stimulate public dialogue on art and culture, will be moving from the Capitol Skyline Hotel to a new development under construction next to the 9:30 Club by the fall of 2015. Before they leave the neighborhood, though, they will install a piece of artwork this summer along the side of the hotel that faces South Capitol Street to cover up the area where the old Best Western sign used to be located. The first image will be from Capitol Hill artist named Julie Wolfe. 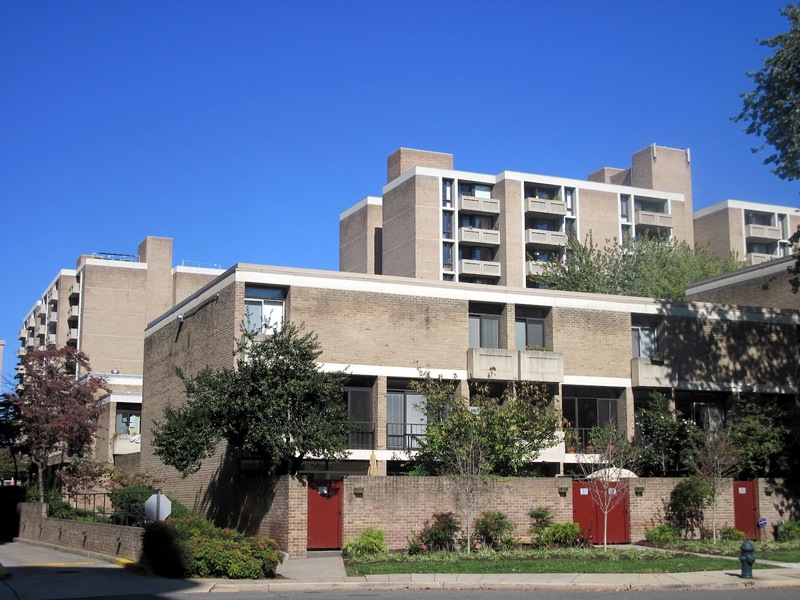 A Historic Preservation Review Board hearing to consider the merits of classifying the Randall Community Center building at South Capitol and I streets as historic will take place on Thursday morning at 441 4th Street, NW, Room 220 from 9:45 to 10:30am. The building was constructed in 1912 and served as the District Dog Pound and Stable. The application was submitted by SWNA and the hearing was triggered because the CBCC has found a developer partner to install new doors and windows on the building. A raze permit was recently filed by the Graduate School USA for 501 I Street, which is the former Southeastern University campus building. The campus is under contract to the Shakespeare Theatre Company (STC), who plans to build actor and apprentice housing, along with rehearsal and performance space, costume and set equipment storage, education classrooms, and the administrative headquarters for the Company. The raze permit was filed to see whether any historic preservation groups would try to landmark the building; however, at the June ANC meeting, the commissioners voted to oppose the permit because STC has not presented their plans for the property to the community. An attorney for STC stated at the meeting that the Company will close on the sale of the campus building in October and are still in the early planning stages, but will soon present their plans to the community. However, a note on the Waterfront Gateway Neighborhood Association website gives an idea of the initial plan for the residential component of the site – a nine-story building with 155 residential units and 70 garage spaces. It was mentioned at the ANC meeting that the building will be designed by Shalom Baranes, the same architect who designed the office buildings at Waterfront Station. 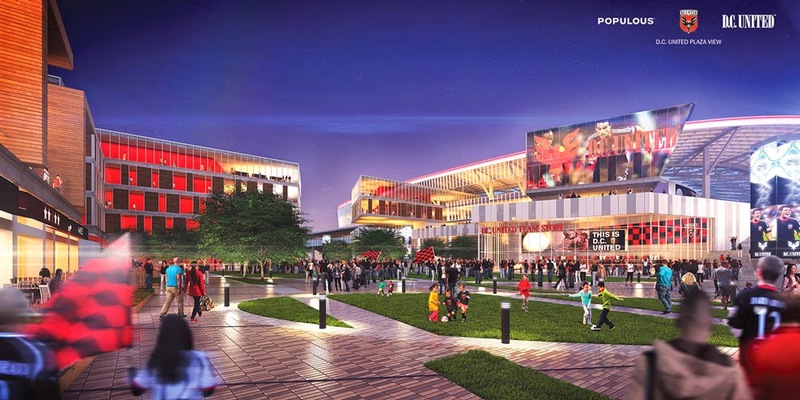 STC will need to request a zoning change in order to build what they want on the site. The Office of the Deputy Mayor for Planning and Economic Development (DMPED) and the Office of Planning are pushing for a plan to include a new Southwest Branch Library as a component of a mixed-use building on a 4th Street parcel the city owns at Waterfront Station. 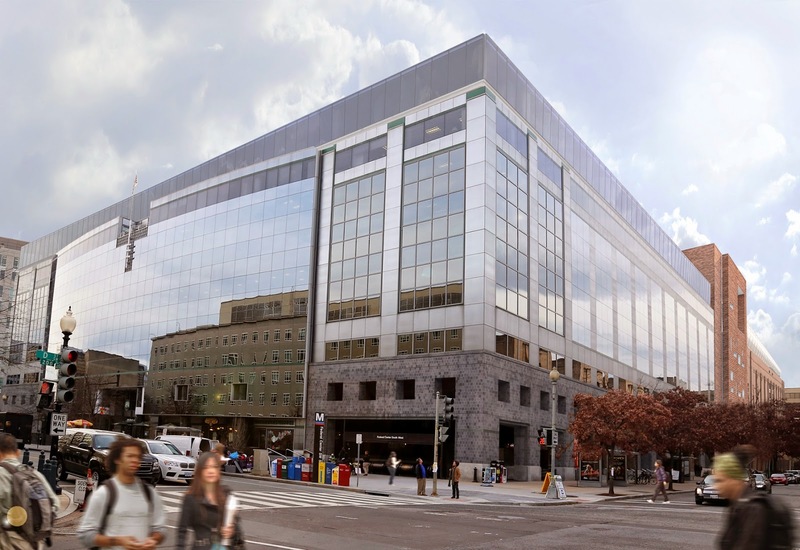 As a part of the agreement made with Waterfront Associates when the former Waterside Mall at 4th and M streets was demolished and redeveloped, the city (formerly the National Capital Revitalization Corporation) would retain the NE parcel for future development as a mixed-use building with ground floor retail and residential units above, a percentage set aside as affordable housing. Marc Bleyer from DMPED is now the point man for disposition of the District-owned NE parcel and is looking to release a Request for Proposals (RFP) soon; however, he needs to determine first whether space for a new library should be included in the planned mixed-use building. DMPED has engaged CORE Architects to come up with some concepts for what is possible for a library that is contained within a mixed-use building, as well as how a standalone library at Wesley Place would look. These concepts will be developed over the next six weeks and presented to the community to gauge support for either option. The city has been building several new or substantially renovated libraries recently – mostly as standalone buildings; however, a library in a mixed-use building is planned in the West End and there are plans to put a non-library addition in the flagship Martin Luther King, Jr. library downtown. Some of the new, standalone library branches built in the city recent years include those in Bellevue, Anacostia, and Deanwood, while other branches that are architecturally significant have been substantially renovated, such as those in Petworth, Georgetown, and Northeast. At a recent meeting with community leaders, most of the attendees expressed their preference for a standalone library for several reasons. A concern shared by many was that a library on 4th Street would take away street-level retail space from potential retailers. Melissa Bird from the Office of Planning pointed out that the 4th Street retail corridor has struggled to sign tenants and a library would enliven the street, potentially attracting more tenants. Also, the library could be placed on the second floor, reducing the space it would take away on the ground level. Some were concerned that children would not feel welcome if the library was on 4th Street because of how some businesses along the street have become inhospitable to minors in their efforts to curb shoplifting. It was felt that children need a place to let off some steam after an altercation in the library and the library park serves that purpose – no such space would exist on 4th Street. Related to the library park, another concern was there would be lost synergy between the planned playground at the park and the library if it moved to 4th Street. Others were concerned that a standalone library at the current site would be overwhelmed by high-rise buildings surrounding it on three sides – the NE parcel at Waterfront Station to the west, a new building planned at Town Center East to the south, and the redevelopment of Greenleaf to the east. Along that line of reasoning, officials from the District Public Library system prefer to move to 4th Street in order to increase visibility and usage of the library. 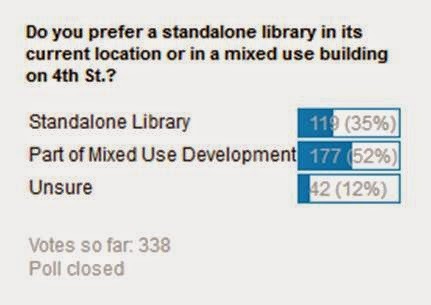 Meanwhile, a majority of respondents to a recent SWTLQTC unscientific poll preferred a mixed-use library on 4th Street. Fifty-two percent of respondents preferred a library on 4th Street, SW, compared to 35% of those who preferred a standalone library. The remaining 12% were unsure. 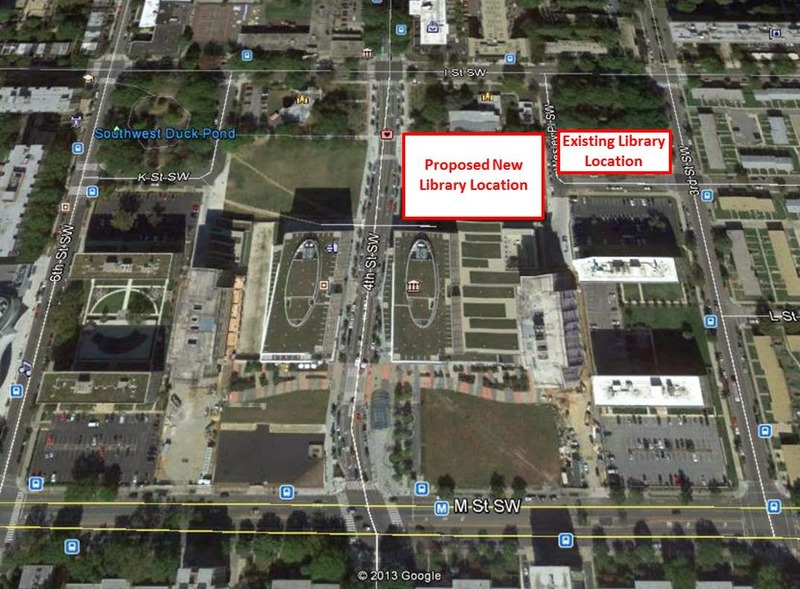 Currently, funding for a new Southwest branch library is tied to the sale of city-owned land. That does not necessarily mean that the land to be sold must be the current library site, but it is implied. There are other city-owned sites around the community that could be sold to fund a new Southwest branch library, including the Department of Motor Vehicles (DMV) inspection station, DMV office, and the fire truck repair facility at Half and M streets. Ward 6 Council Member Tommy Wells has stated that the DC Council could find a way to fund the new library in future budgets without the need to sell District land. If the current library site is sold, under current zoning, a building up to six stories tall could be built in its place if the owner goes through the Planned Unit Development (PUD) process. Proposed changes to the zoning code would allow for a similar amount of density on the site by-right. The library park to the north would remain whether the library is retained at its current site or moved to 4th Street, so the planned playground is not in danger of being scrapped. In fact, a design-build contract was recently awarded by the Department of General Services for phase one of the park, which includes infrastructure improvements and play equipment in the center berm area. A community meeting will be planned sometime this summer to discuss the concepts that CORE Architects has developed, then a RFP could be released sometime in the fall, with or without the library component. In the meantime, the vacant NE parcel will receive some upgrades in the coming months. The diagonal gravel pathway will be replaced with concrete or interlocking concrete pavers and semi-circular pathways will also be constructed using compressed stone. These improvements will accommodate a temporary art installation for 5 x 5, A Project of the DC Commission on the Arts and Humanities. 5 x 5 is the largest, temporary public art project in the District. Designed by Lance Fung, the Waterfront Station installation will feature the work of five artists in a piece called Nonuments, described as “a temporary sculpture park featuring ‘monuments’ devoted not to the great but to ordinary people, to the ideals of democracy, and to the common struggles of humanity.” Nonuments will be on display from September 1 to December 6. View of the stadium from Potomac Avenue. View of DC United Plaza. View of the north Main Concourse. View of pitch from lower level seating area. 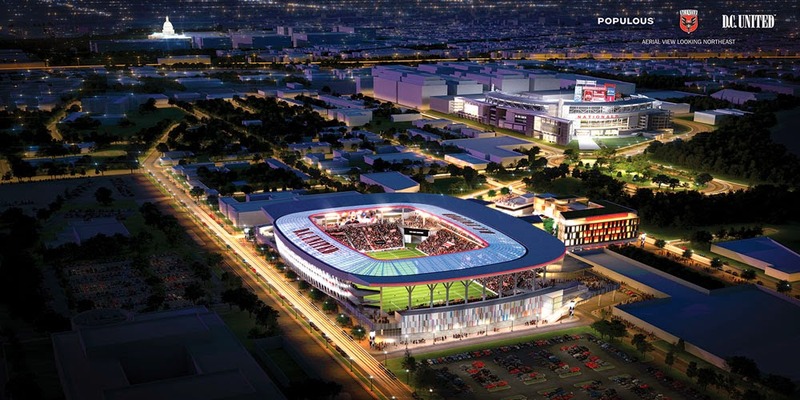 As currently designed, the length of the stadium’s pitch will run along 2nd Street from R to T streets and the width will cover approximately one block from 2nd to 1st streets. Potomac Avenue will end in a traffic circle at 1st Street and will turn into R Street for one block until it terminates at 2nd Street. 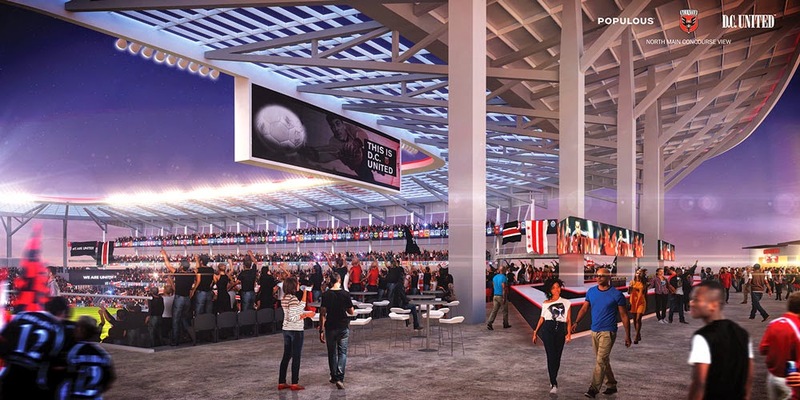 The portion of R Street that currently exists from Potomac Avenue to Half Street will disappear and become part of a large plaza that will front the stadium. A group of small buildings will line most of Half Street except for the northern-most section that will be part of the plaza. (see below rendering) The southeastern corner of the stadium footprint at Half and T streets will still contain Pepco’s outdoor substation, so some screening will need to be done to cover that up until a new substation building is constructed at 1st and Q streets. Power is no longer generated at the Buzzard Point Power Plant, which is located at Half and V streets. View of the stadium toward the southwest. The first DC Council hearing will take place at the Wilson Building downtown on June 26, starting at 9:30am. Predictable public school pathways for families. High quality schools of right in every neighborhood. Access to public school choices other than assigned schools. Walkable and safely accessible DCPS elementary schools. Coherent and efficient citywide public school infrastructure. Most of the changes in Southwest have occurred in the elementary and high school levels. With the scheduled opening of Van Ness Elementary school in Near SE/Capitol Riverfront/Navy Yard and since Amidon-Bowen is nearing capacity, the new boundary for Amidon-Bowen has shifted west to South Capitol Street. Students will continue to attend Jefferson Academy, but will now have to attend Eastern High School in Hill East instead of Wilson. The proposal can be found here and a map of boundaries city-wide can be found on The Washington Post (be wary of the borders shown in the WaPo…they aren’t completely accurate). Feedback on the proposal will be accepted until July 21 by either filling out a form, sending an email, or calling 202-478-5738. These changes, if approved, will begin to go into effect in the 2015-16 school year. 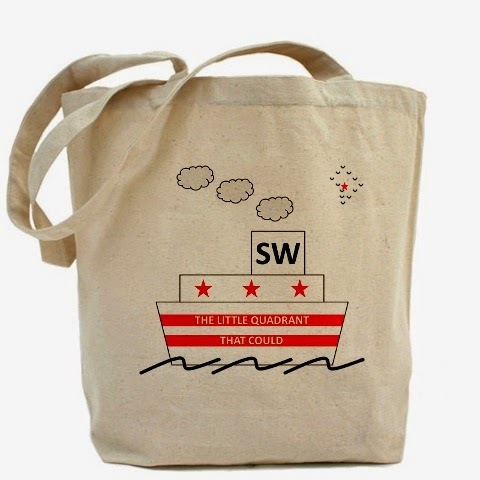 A Few Quick Sunday Afternoon Items: Stadium Update, Wharf Planner Awarded, New Businesses to SW? 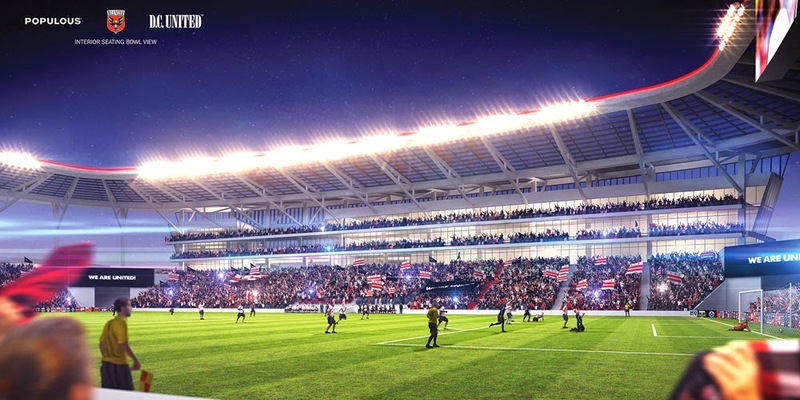 Now that the DC Council has received legislation on the DC United stadium deal in Buzzard Point, more voices are making themselves heard regarding their position on the pending deal. An editorial in this week’s Washington Business Journal (subscribers only) gave its support for the stadium deal, starting with this statement, “We have never been closer. 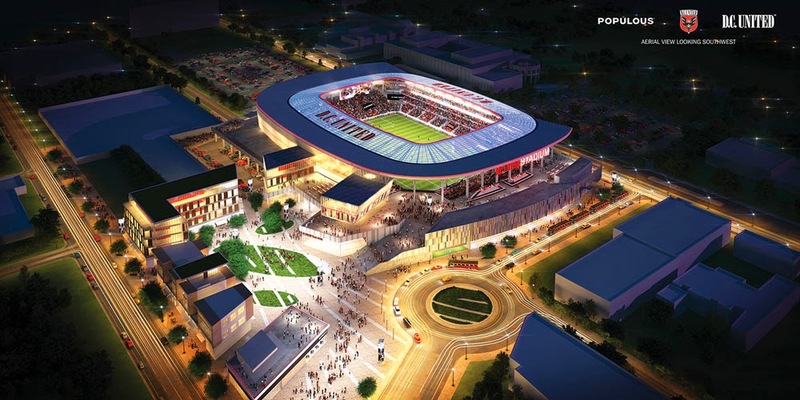 If the D.C. Council does not approve the deal for a new D.C. United soccer stadium, the deal will die. D.C. United will leave. And Buzzard Point will languish for another decade.” Ward 7 Council member Yvette Alexander recently tweeted her support for the stadium (since deleted), while Ward 6 Council member Tommy Wells has expressed reservations about the deal, according to a City Paper article, because the Council recently cut streetcar funding (two streetcar lines are planned to terminate in Buzzard Point near the stadium). 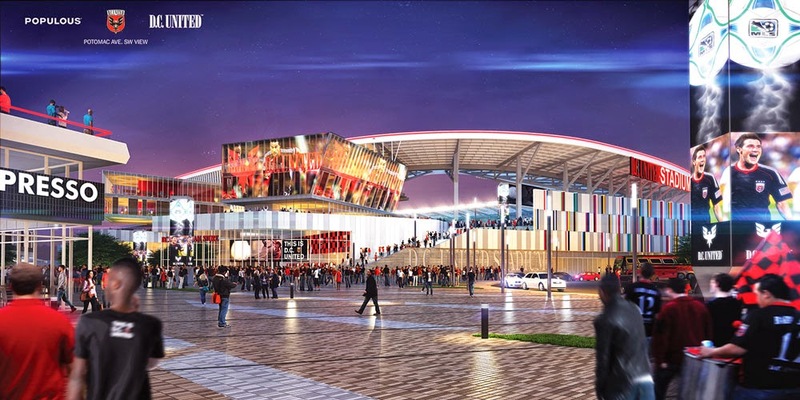 Council Chair Phil Mendelson was quoted on WJLA that he doubts the stadium deal will be voted on by the Council before the fall, so the next mayor will have the final say whether the deal goes through. 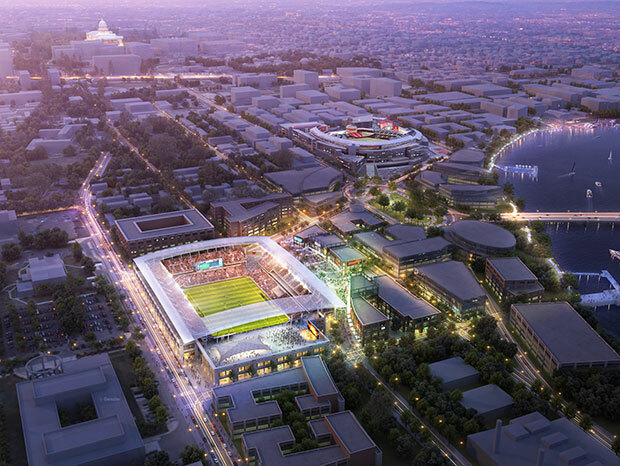 The first DC Council hearing on the stadium deal will be on June 26 at 10am. 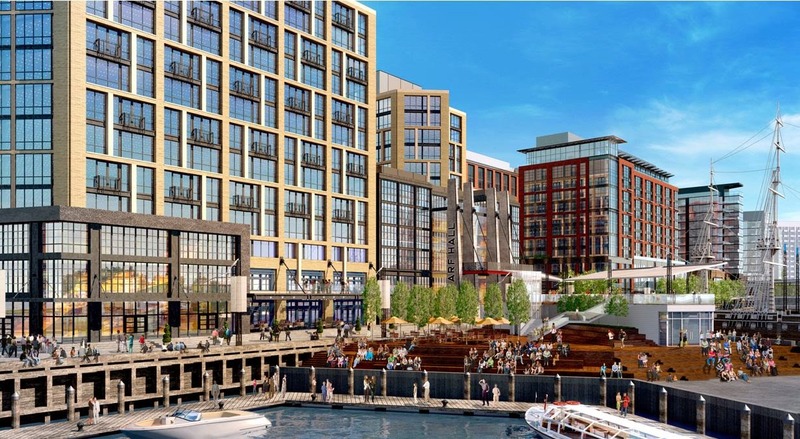 Washington, DC's mixed-use Southwest Waterfront development, aka The Wharf, is designed on the premise of reconnecting the city with its waterfront and creating a place that residents can be proud to call their own. 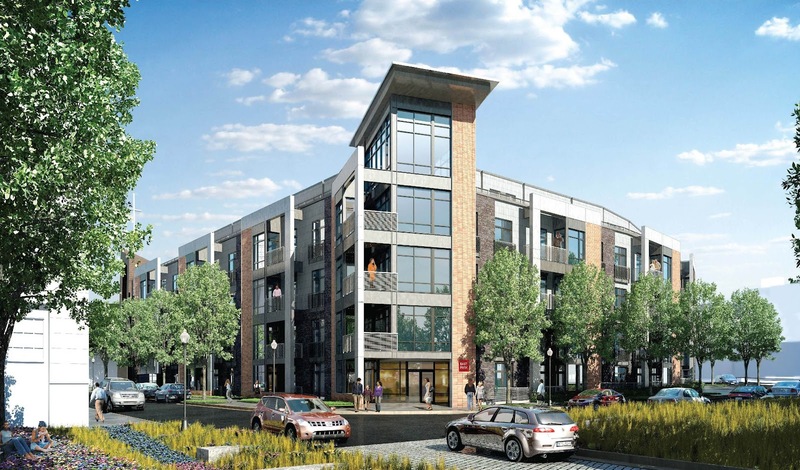 Stretched across 27 land acres and 24 water acres, with 1.9 million gsf of building area comprising the first of three phases alone, this neighborhood revival has long been a glimmer in DC residents' eyes and now construction is underway, with a projected completion date of 2017 for Phase 1. The entire development is targeted for LEED-ND Gold, with all new buildings planned to achieve a minimum of LEED Silver. It was reported over the past week that two new businesses may be considering Southwest for their headquarters. First up is Pigmental, a newly formed digital animation studio that is relocating from California to the District. 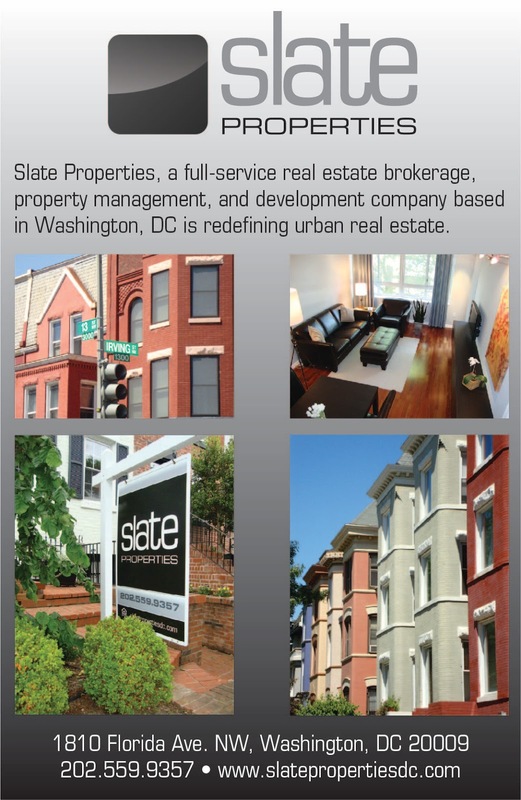 The Washington Post reports that the company is considering moving to either Georgetown or the Southwest Waterfront. 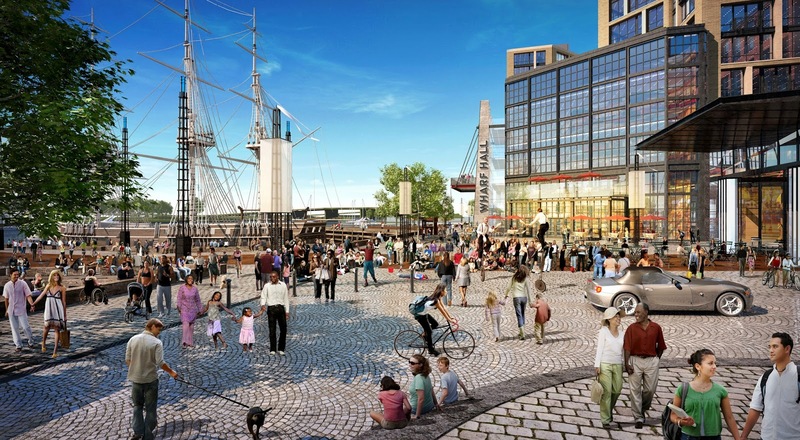 The article didn’t state where in Southwest they are looking, but I imagine one of those places isn’t The Wharf, since the first phase isn’t scheduled to open until 2017. Pigmental is planning to begin operations with about 24 employees, with the possibility of expanding to 60 people. Another firm looking to move to the Washington metro area is McCormick & Co., the Baltimore-based company known for making Old Bay Seasoning. In a WBJ article, the author speculates that if McCormick chooses to relocate to the District, a logical place would be The Wharf, although the company is looking for over 300,000 square feet of space and the first office buildings at The Wharf are under 300,000 SF. A raze permit was recently filed for St. Augustine’s Episcopal Church, located at 600 M Street. The church came to an agreement with the developers of The Wharf to redevelop its site (Parcel 11 of The Wharf) and create an endowment. Demolition is scheduled for this summer and in its place will be a new, two-level St. Augustine’s and a 108-unit, mixed income mid-rise condominium. The last service in its current building will take place tomorrow at 9:30am. 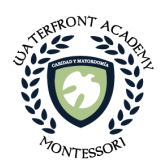 Afterwards, the church will move temporarily to the fellowship hall of Christ United Methodist Church at 900 4th Street. 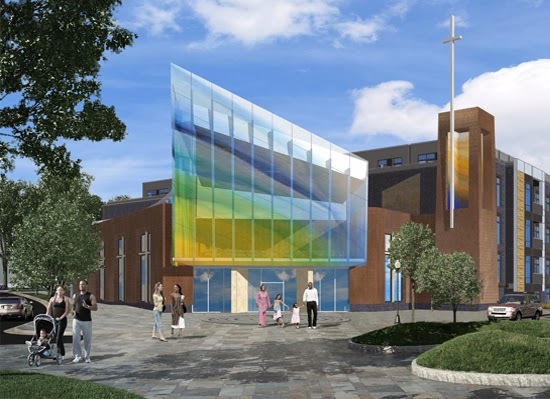 The new St. Augustine’s should open in early 2016 and will be the first component of The Wharf to be completed. On Monday, the JBG Companies celebrated the opening of the new glass atrium that serves as the entrance to the retail center at L'Enfant Plaza from the square facing 10th Street. The 32-foot high atrium brings natural light down into the retail center, which has been expanded from the initial phase that opened in 2011. Below are some photos taken earlier this week. Along with the atrium, the landscaping surrounding it has been improved with trees and green space, and hardscape elements including cafe seating, tables, benches, and lighting. A wide staircase leads down from the square to the retail center, where soft seating has been installed along with television screens. WiFi access is available for patrons. The design of the second phase of the retail center is consistent with the first phase, which was designed by SmithGroup JJR. More seating is available near the restaurants that will soon open in the second phase. The first of the 13 new retail and dining establishments that will open in the second phase is scheduled to open this week (Charleys Philly Steaks), with the rest coming online over the next several weeks and months. I’ve been so swamped lately I almost didn’t get a chance to acknowledge that today is SWTLQTC’s sixth anniversary! Here is a quick note related to my very first blog post on Wednesday, June 4, 2008…a tower crane recently was delivered to the 400 E Street mixed use project site. The DC government released a RFP in 2008 for two parcels it owned just north of the freeway. After several years of delay, construction began in late 2013 on the first phase of development at 400 E Street. In 2015, a new Hyatt Place hotel, Engine 13 firehouse, a new headquarters for KidPower, and ground floor retail will be located there, which is being developed by E Street Development Group. The second phase at 6th and E streets will be developed at some point as an office building after 400 E Street is completed and Engine 13 vacates their current location for their new home. A webcam has been set up of the construction site.